Gabriel may be tempted to call in the trading standards again, but here's a preview for the Wasps game. In search of help on writing this preview I read through previous ones and found OxonRob's that preceeded the last visit Irish made to High Wycombe. When he wrote that preview I can't imagine that anyone thought Irish would hand Wasps such a humbling as the one they received in front of 10,000 people at the then named The Causeway (now Adams Park) in April this year. I'd imagine that it was a bit of a shock to everyone. Fourteen tries in all with Ojo and Flutey grabbing two each and Catt, Armitage, Feau'nati, Sailosi and Casey scoring one-a-piece for the delighted Irish in a 56 to 37 victory that secured a play-off spot for Irish and gave Wasps a tough task of winning at Kingsholm if they wanted to get to the play-offs themselves. Yes, definitely a shock and I can't help feeling that Wasps may well still be smarting from it. Ex-exile himself, Paul Sackey was rumoured to have said that Wasps would spank Irish and that our back three had a lot to learn, yet the lesson taught that evening must surely have been to Wasps and the subject was don't turnover the ball to London Irish if your defence (blitz or no-blitz) can't cope with the pace. It is possibly true that our own defence was not water tight that evening since Wasps scored five of their own tries and at times against some poor defending by Irish. There is no way that we could possibly expect a repeat performance of that match is there? For starters, that game was record breaking. It was the eleventh straight away win, a new club try-scoring record, the first team to score 50 league tries in a season, Wasps had been unbeaten at home since January 2005, first Irish win over Wasps in nine matches and Bob Casey scored a try in his 100th game for the club. So no it won't be the same record breaking type match, but it may well be a similarly styled, flabouyant game of fast paced attacking rugby that yields a high try count and who knows maybe even another victory for Irish. You get the feeling that is how Brian Smith wants all the games played with high-risk entertaining rugby rather than dour and rigid game plans and who can say it didn't work last season. Let's hope it will again. But as I suggested, Wasps may be smarting from the beating they took last time out and rugby director Ian McGeechan and coach Shaun Edwards will be hoping for more from the coming season than the Power/Anglo-Welsh/EDF Energy 'crown' having in the recent past bagged three Guinness Premiership titles and a Heineken Cup to boot. I think Wasps will be keen to start the season well with another victory having narrowly beaten a dogged Saracens side, though the Wasps display was apparently not the prettiest. But then the same could be said for LI's last gasp victory over Quins. Neither Wasps nor Irish greatly impressed at the Double Header with Wasps managing two tries and Irish only one, but that was the "first day of term" so can we read much into it? OxonRob, Loobs and other previewers will have already covered our own off-season additions, while at Wasps it looks on the face of it like they may have lost more than they gained. Stuart Abbott, Ben Gotting and Matt Dawson are the high-profile names to leave along with Mark Lock, Jon Dawson, Thom Evans, Tim Foster, Rob Laird and Justin Va'a while incoming to Adams Park are Tom Palmer, Mark McMillan and David Doherty from Leeds, sevens specialist Simon Amor from Glaws, Wilko's understudy for many years Dave Walder and Nick Adams from ND1's Cornish Pirates. Veteran prop Phil Vickery has also joined from Glaws but is not expected to be fit until October. Who will take up the mantle of gobby-ist Wasps player now that Dawson has retired? Does Lawrence Dallaglio have the mouth for it? In the off-season Shaun Edwards, often known as the architect of Wasps' current blitz defence system (Eddie Butler's low-down on the blitz, is quoted as saying that not winning their last game of the season has been like having an irritating a stone in the shoe, so perhaps losing to Irish has been more like having nine drawing pins spiking through his flip-flops (one for each try his defence leaked in that "match of the season"). I expect Wasps to be fully prepared for Irish this time around and will be out to wipe that game from their collective memories. I have a major concern that soon after our high point of the season (the win in Wycombe) came one of the painful points (the loss in Leicester) and if Wasps have studied that match may have a plan to starve Irish of the ball and send us home without even a bonus point this time. I don't think there is anymore I can say on this except that have you noticed how Wasps become a real pest as the summer draws to an end? Well, here's something you might not have known before, in the early part of the summer the young larvae are fed meat by the wasp drones and in return secrete a sugary syrup for the drones to drink. In late summer all those larvae have grown up so the Wasps come looking for sweet things from us. Bloody nuisance they are too! Shoo, Shoo! Ok, one last thing. Pictures tell a thousand words. Last edited by dom_pedro on Fri Sep 08, 2006 9:33 pm, edited 1 time in total. Nice one, DP. Let's hope for a win on Friday night. 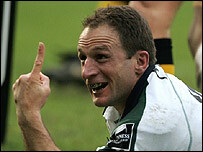 By the way, Laurence has always been, arguably, the gobbiest Wasps player. In the absence of Dawson, I'm sure that Larry will be on hand to assist the ref with his decisions. Absolutely no question of a referral to trading standards for that preview. For one thing it is a preview (and a good one), and for another it appeared on this wonderful site, which as the Mammy often says, has no peer the length and breadth of heathen England.